The first thing we did on Monday was head for Camp Kim, where we could get our passes for going on and off the base. Because we arrived here the evening before the 4-day Christmas holiday, we had to always enter by the main gate, turn in our driver's licenses and get a temporary pass. The temporary pass is only good for 24 hours, so we had to be sure to leave the base and come back in every day. We went out a lot, so it wasn't a problem, but we couldn't go in or out the gate that is only a 5-minute walk from the house. It was a quick and easy process, as Anjali had already filled out the paperwork and had copies of our passports. All we had to do was sit for a photo and have our index fingers scanned for prints. After I posted my DMZ blog, I remembered to consult the notes I took (blame jet lag!) and there were a few very interesting things that I forgot to note. First, as we traveled out of the city, I saw acres and acres of greenhouses (or perhaps cold frames, they seemed a little less substantial than true greenhouses). Since the city has 10,000,000 residents, the vegetables have to come from somewhere! Another thing was the wildlife. Since the DMZ has been there for over 50 years now, wildlife has flourished. As we drove along, I saw many groups of birds, especially water birds. Once I saw a flock of cranes. We went by too quickly to determine if they were Siberian cranes or a more common type (my mother would have known!). And as we drove home, we were on the side of the bus that faced the DMZ itself. It was a bit chilling to see the frequent guard posts and floodlights that were attached to the razor-wire fence. The guard posts were mostly unmanned and most faced the wide river. Back to Monday! After we got our passes, we were able to head out for some city touring. 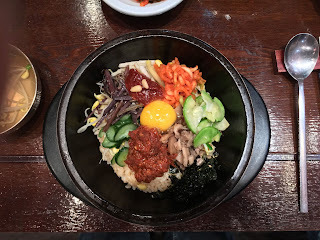 We walked the five minutes to the nearest subway station and took the train with one transfer to the Insadong area. It is known especially for arts and crafts, as well as antiques. We browsed around and stopped at a mall for lunch. This was our first traditional Korean meal and was very enjoyable. We started with a mug of warm, light green tea that was automatically delivered. We ordered bibimbop, a common dish. It means mix-mix-bowl and was first a creative way to use leftovers. 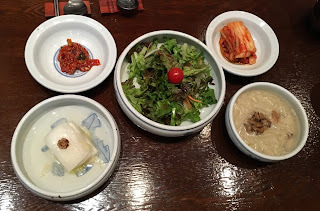 The accompaniments arrived first: salad, kimchi (upper right), onions and mushrooms, and two things on the left. The lower one was cabbage, but we never figured out what the upper left one was! The bibimbop arrived in a very hot pottery bowl on a plate. It was quite beautiful. 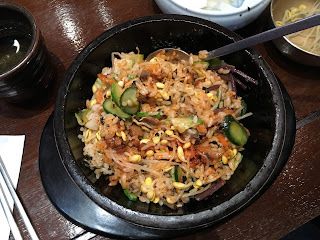 The rice is in the bottom and various things are on top (this dish is different almost anywhere you find it). A raw egg is in the center. Immediately you stir it around thoroughly to combine the ingredients and cook the egg. At the end of the meal, we were brought some cold plum juice, delicious! After lunch, I took the opportunity to use the restroom. I found the instructions inside the stall enlightening. Most places here do not want you to put toilet paper in the toilet, as the plumbing systems don't handle it very well. 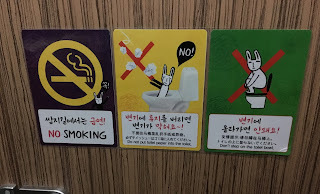 And I do not stand on the toilet! 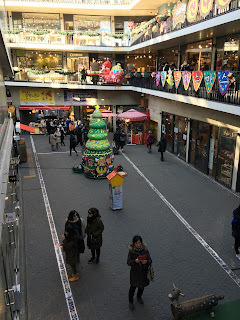 We walked around the outdoor mall, which was cleverly designed with a sloping floor so moving from one level to the next wasn't even noticeable. The shops had a wide variety of items, mostly things you would use as gifts. Each shop was very small. The weather was very cold and we did a lot of walking. 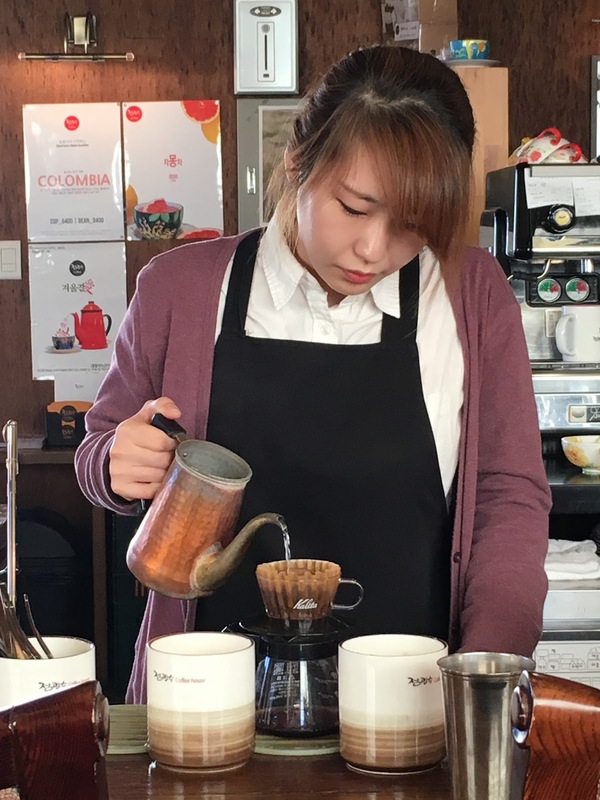 We stopped by by a coffee shop where they grind the beans for each cup. It was fun watching the barista. She had a tall thermometer and poured the hot water between two pitchers until it was the exact temperature. It was a slow drip and the coffee drinkers said it was excellent. 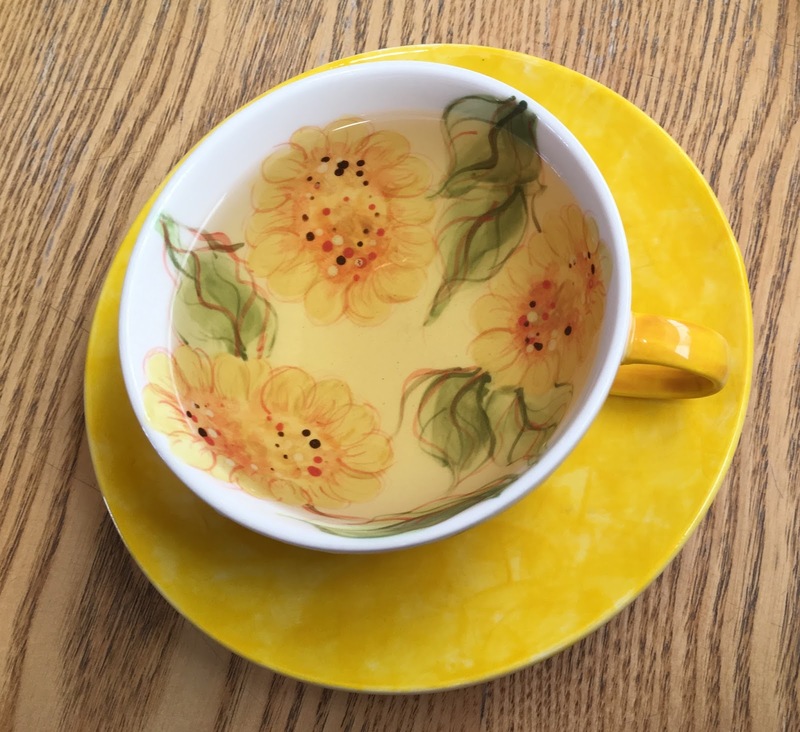 As usual, I had tea; this time chamomile-mint blend in a beautiful cup. We took the subway back to Itaewon, the area closest to where we were staying. 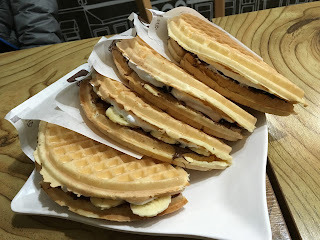 We stopped by Anjali and Domingos' favorite snack place, a waffle shop. 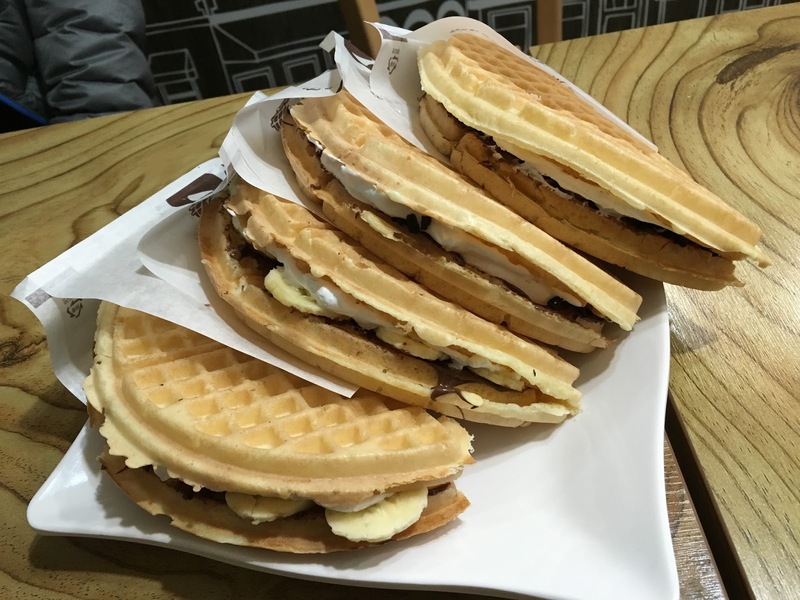 They had many varieties, some filled with ice cream. The top two are Nutella and Oreas, the bottom two are Nutella and bananas. All delicious and filling!